“The Way Out,” “The Gathering” and “Rent” were exciting to score, because they broadened the scope of the series and pushed me to further explore Scottish folk songs and instrumentation. They were challenges, however, because each had a unique tone. While the story obviously has a larger structure that plays out incrementally, each episode is it own unique adventure. Nevertheless, I feel like I have found the soul of the score by this point, having firmly established character themes and having introduced at least a dozen traditional Scottish folk songs. One thing I hope has become obvious to fans by now is a prominent difference from week to week: the Main Title music changes every week! Ron and I were excited to custom-tailor the music each week to match the tone of the episode it precedes. The majority of every title sequence remains unchanged: vocalist Raya Yarbrough sings “The Skye Boat Song,” and is always joined by a warm string orchestra, bagpipe band and Scottish marching drums. The ending, however, changes from week to week. In the first episode, Uilleann pipes quote a final refrain of the melody before fading out. In the second episode, a penny whistle states the melody, and is joined by bodhrán, and they extended the theme well into the first scene, bridging the title and the first score cue. 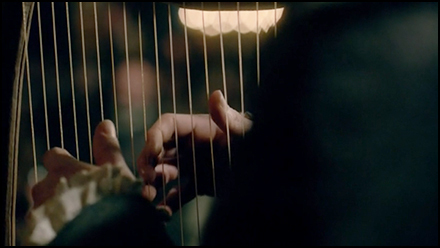 In the third episode, the main title ends with a solo Celtic harp, to foreshadow the musical performance that will end the episode. In the fourth episode, we hear a solo fiddle and in the fifth we hear a seventeenth-century instrument called a viola da gamba. This means there will exist sixteen unique variations of the Main Title theme by the time the first season concludes! The third episode, “The Way Out,” was memorable because it features several musical performances by Gwyllyn the Bard, a character played by Scottish musician Gillebrìde MacMillan. The producers wanted the performances to feel as natural as possible, but the episode presented inherent musical challenges preventing us from simply recording a live player on the set. First of all, the scenes featured whispered dialog between characters during the music, so it couldn’t be played live on set. Furthermore, the final performance of the episode was a remarkably complex layering of musical meaning that would require as much control and isolation in the final mix as we could muster. I distinctly remember trying to wrap my head around the challenges I faced when I read the script. 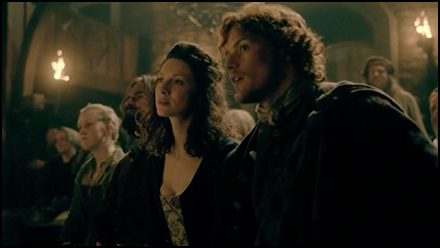 First, the song would begin as a live performance in the hall, during which Jamie would narrate the translation of the lyrics to Claire. Then, the music would evolve into score as the narrative goes into Claire’s mind, then the music would exist as both score and song for the final moments of the episode. With multiple levels of musical narrative and multiple layers of clashing dialog going at the same time, I knew I would need to approach this scene carefully. 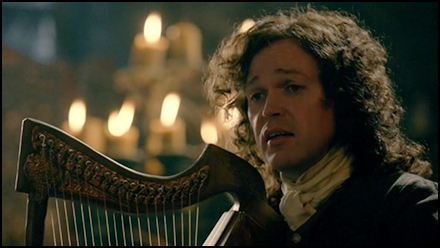 Due to the realities of production schedules, “The Woman of Balnain,” the song that concludes this episode, was actually the first music I ever composed for Outlander. The lyrics are by Diana Gabaldon herself, from her books, and getting to set them for this collaboration was the perfect way to start my experience on this series! I was thrown immediately into the deep end of the pool, and was asked to write a single piece of music that could accomplish the source and score needs for the scene, and be practical for Gillebrìde to perform on camera. Gillebrìde did a fantastic job with the tune, as well with the folk tunes he performed, “An Fhideag Airgeid” and “Gradh Geal Mo Chridhe.” To afford us the most control in the mix, I re-recorded the Celtic harp performances, so I could integrate the instrument into the score and have it match perfectly, and also so I could feature it in the episode’s unique Main Title. The end result worked spectacularly. Gillebrìde’s vocal performance is moving, and the newly recorded harp bridges the performance in the hall with the instrumentation in the score. Even with the layers of source music and score, I think the story is easy to track, and more importantly, the emotional impact is there. We feel Claire’s growing elation and surge of adrenaline as she discovers there may yet be a way to get home. “The Way Out” has wonderful score moments as well. During the episode’s flashback to the train station with Frank, I brought back the solo clarinet playing Frank’s Theme, reminiscent of their cues from the first episode. Father Bain’s scenes are scored with a creepy, organ-like drone that gives him menace. The drone was achieved by digitally lowering a bagpipe drone further than it could play acoustically, giving the sound a distinctly Scottish flavor that is nevertheless difficult to pinpoint, because it is not actually what bagpipes sound like. This is a technique I will explore more in coming episodes. Technology makes it possible for me to push the limitations of the bagpipes as orchestral-style instruments. My favorite cue was written for the montage when Claire works in her surgery. A solo fiddle offers a playful rendition of “Comin’ Through The Rye.” Fans in attendance at the Comic Con premiere may remember that violinist Paul Cartwright and I performed this piece together before the screening. The following episode, “The Gathering,” allowed me to quote even more of my favorite folk tunes. As The Gathering begins, Mrs. Fitz leads Claire through the castle (memorably passing Ron Moore and Diana Gabaldon during their brief cameos!). In the score, heavy percussion and fiddle accompany the Uilleann pipes performing “The Haughs o’ Cromdale,” a tune I felt gave the scene a sense of weight and importance. To augment the excitement, I threw in one chord change in there that isn’t historically accurate, but it gives the whole track a sense of forward momentum. I simply couldn’t resist throwing in just one modern chord. See if you can spot it! At the conclusion of the episode, I had a blast writing an arrangement of one of my favorite folk tunes, “Clean Pease Strae,” for the lively scene where Dougal charges in to the game of shinty. I featured penny whistle, Uilleann pipes, small Scottish pipes and fiddle, at a tempo a few clicks faster than would be comfortable for the players. (I would’ve added an accordion layer myself, but found that it was just too damn fast and I didn’t have the time to learn it!) The blistering tempo pushed my players to their limits and gave the track a sense of urgency and fun that matched the scene beautifully. 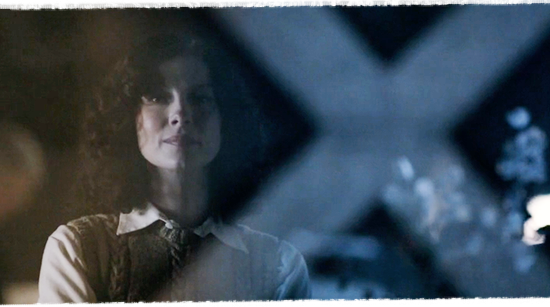 The majority of the score for “The Gathering” is tense, and brooding, following Claire’s plan to escape the castle at night. Claire’s escape is underscored with a driving 6/8 pattern of chugging acoustic guitars, dulcimers, shakers and bodhrán, instruments laying the foundation for harmonic tension provided by small string ensemble textures and Scottish pipes. The most exciting cue in the episode takes place at the end. 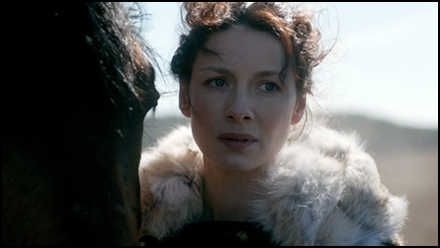 Dougal informs Claire that she will accompany him as he heads out in their territory to collect rent. Here, the solo fiddle introduces a driving 9/8 figure, soon to be joined by strings, bodhrán, Celtic harp and strumming acoustic guitars. The Uilleann pipes introduce a rousing version of the Claire and Jamie Theme that carries us over the fade to black into an energetic end credit that promises adventure to come. 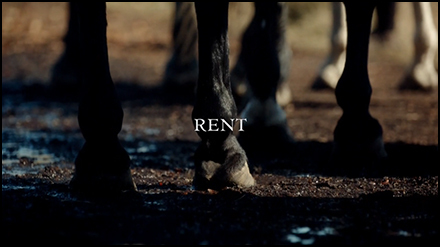 That promise pays of magnificently in the fifth episode, “Rent,” one that narrowly ranks as my personal favorite of the first season, because of its attention to historical detail. 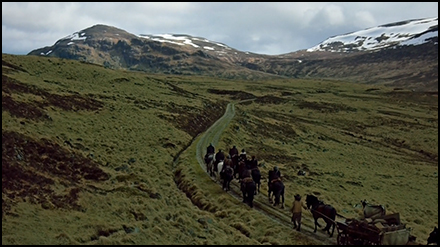 In this episode, Claire travels with her new companions and has left the confines of Castle Leoch far behind. The vistas are sweeping and inspiring. I was tempted to fill the gorgeous cinematography with huge, orchestral passages, but I had to restrain myself. While the visuals are stunning, our protagonist feels trapped and stifled, diminished by companions whom she believes are mocking her. To reenforce that story, I played the music down, underscoring the idea that she is still trapped, even though the visuals implied otherwise. 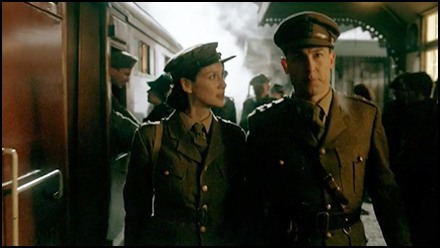 I was deeply moved by this episode, because it ties directly in with the history of era that I have always adored. Claire gradually comes to realize that Dougal is not a thug robbing from his tenants, but is in fact a rebel leader raising funds for a Jacobite army. Finally, it dawns on her that all these men, for whom she has come to care deeply, will likely be slaughtered in two short years at the Battle of Culloden. With the series now tying directly into the politics of the era, I felt compelled to use folk tunes to help establish the narrative. The first tune you will hear takes place during the montage where villagers pay their tributes to Dougal. Here, two viola da gambas, accordion and Celtic harp offer my jaunty arrangement of “To the Begging I Will Go.” In the second half, they are joined by guitars, bodhrán and the Uilleann pipes taking over the melody. The lyrics to this well-known tune are about poverty, so I chose it to highlight Claire’s perspective. She thinks Dougal is pocketing the money for himself, forcing his tenants into poverty for his own gain. For the vast majority of the audience, this added layer of meaning will go unnoticed, but I like having it there for those who can pick up on it. Besides, even if the viewer doesn’t know the lyrics or the history of the song, there is a slithery quality to the melody and tempo that suggest Claire’s suspicions. Some of the most authentic folk music you will hear this season is in this episode, in the scenes with the wool waulking group, and the traveling songs the Scots sing. I worked with the writers and producers to help select material for these scenes, but the true authenticity comes from the waulking group, who are the real deal. I was amazed at the footage when it came back, because it was so authentic. The most prominent folk tune I quoted in this episode is “The Skye Boat Song,” used for the moment when Claire finally understands Dougal’s true intentions. I wanted to put a piece of music here that could serve as an anthem for the Jacobite cause. As with “To the Begging I Will Go,” any viewer who knows the history of this tune, knows that it refers to Bonnie Prince Charlie. However, the beauty of selecting this song here is that, by this point in the series, every viewer is intimately familiar with the melody: it is our main title theme! 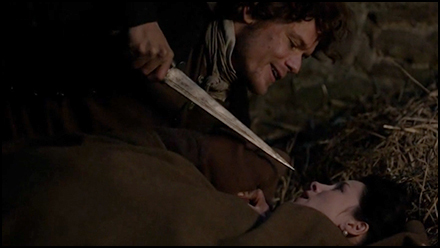 My hope is that the resulting familiarity triggers an emotional reaction to Claire’s realization, even if the viewer does not yet know what the Jacobite cause was about. Ideally, just hearing the Main Title theme quoted within an episode for the first time will immediately inform viewers that something important is unfolding. 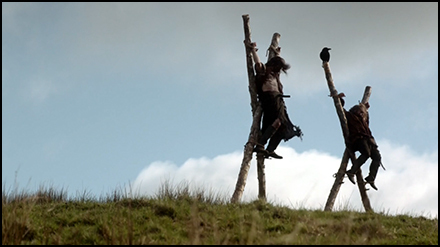 Toward the end of the episode, Claire and her companions encounter Scots who have been crucified along the side of the road. This begins an elegant montage that bridges the scene with a funeral and Dougal’s next speech to rally support. I underscored this entire sequence with a moving arrangement of “The Highland Widow’s Lament,” performed by fiddle and supported by strings. The most well-known lyrics to this tune, by Robert Burns, date to a bit later than our time period, but it is certainly conceivable that the melody itself existed during 1743. More importantly, however, the emotion in the song was a perfect match for the somber scene. I distinctly remember conducting this at the session and feeling my eyes water up as I watched the scene. 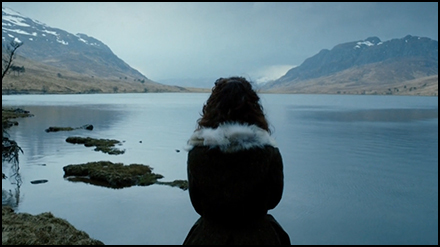 The last folk tune in “Rent” is used during Claire’s flashback to visiting Culloden with Frank. Up to this point, every scene with Frank has been underscored with the Frank Theme in one variation or another, in order to reenforce their relationship. 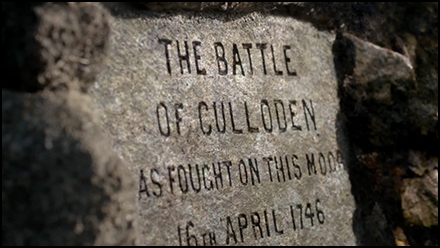 This scene, however, served a different purpose, functioning instead as a narrative device to inform audience members of the significance of Culloden, should they not know why its name is infamous. The Frank Theme here would have been inappropriate. Instead, I wrote a sparse Celtic harp arrangement of “Ye Jacobites by Name.” The lyrics, again by Burns, highlight the tragedy of the Jacobite uprising. I was always struck especially by the final line “and leave a man undone to his fate” and felt it was painfully appropriate for this scene. Again, if viewers are familiar with this melody, their experience is augmented when hearing it quoted in the score. I hope, however, that viewers unfamiliar with the song are still equally impacted by the melancholy nature of the music. A solitary Celtic harp piercing a bed of ominous low strings will sound funereal in just about any context. 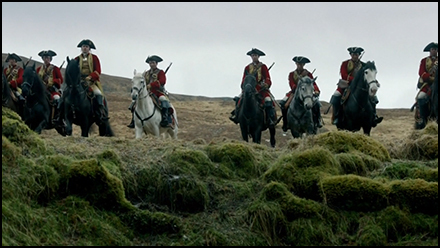 In the final cue of the episode, Claire and Dougal suddenly encounter redcoats, represented thematically by a military cadence played on field drums with their snares off. This is a color I’ve used to represent the redcoats before, in “Sassenach” and “Castle Leoch,” and one that will become increasingly important in coming episodes. No two episodes of Outlander are alike, and in that regard, the next three episodes presented even bigger challenges. I will write a blog again about them at the mid-season finale in three weeks. Thank you all for watching, listening and reading!